First published in 1987, this book discusses white-collar or commercial crime which has grown to be a major issue in our society today. Looking at research from North America and Britain, the book explores the way fraudsters are treated. It draws on various disciplines including Economics, Law, Politics, and Sociology in order to show the frequency and impact of different types of fraud. 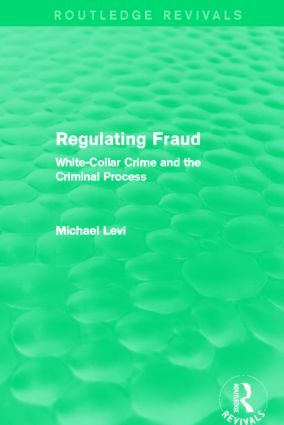 In this book, Dr. Levi introduces the reader to the key areas of debate: What pressures influence the law on fraud? How do state agencies, self-regulatory bodies, or other professionals police fraud? To what extent are money-laundering and international organized crime breaking down the distinction between policing of the underworld and the upperworld? Dr. Levi concludes with an analysis of national and international policy trends in relation to fraud. This book will be of interests to students of criminology, politics, and the sociology of law as well as to practicing lawyers and other professionals in the business sector.